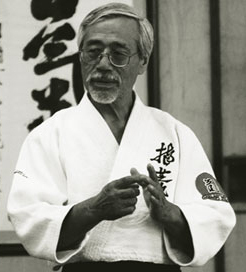 Saotome Sensei is Founder and Chief Instructor of the Aikido Schools of Ueshiba, the Aikido Shobukan Dojo in Washington DC and the Aiki Shrine Dojo in Florida. He and his students have established many dojos in the United States and he conducts training camps and seminars throughout the country and abroad. The Aikido dojos he founded in Japan are still thriving and he occasionally travels there to spread his teaching and give demonstrations. He has given demonstrations of his art throughout the world. His two books “Aikido and the Harmony of Nature” and “The Principles of Aikido” have been translated into many different languages. “Aikido: Living by Design” (edited by Susan Perry) graphically explores Saotome Sensei’s unique ability to realize Aikido philosophy in his many artistic pursuits and in his daily life. The Jionjuku Aikido Academy of Warrior Spirit are students of Saotome Sensei, and we are affiliated with the Aikido Schools of Ueshiba. Aikido and the Harmony of Nature (1993, Shambhala Publications). Available at Bujindesign.com, Amazon.com and major booksellers. The Principles of Aikido (1989, Shambhala Publications). Available at Amazon.com and major booksellers. Aikido: Living by Design (2004, Arete Press) by Susan Perry and Sensei Mitsugi Saotome. Available at Amazon.com and major booksellers. A Light on Transmission (2015, Cedar Forge Press) by Sensei Mitsugi Saotome. Available at seattlebookcompany.com and major booksellers. This special, early edition is signed by the author, Mitsugi Saotome. Signed copies available only for pre-order. 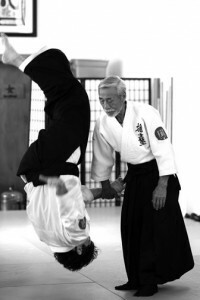 Principles of Aikido. Available at Budovideos.com and other online retailers. Staff of Aikido. Available at Budovideos.com and other online retailers. Sword of Aikido. Available at Budovideos.com and other online retailers. Two Swords of Aikido. Available at Budovideos.com and other online retailers. Takemusu Aiki. Available at Budovideos.com and other online retailers. Oyo Henka. Available at Budovideos.com and other online retailers.